Edmonton is a Canadian city with a population of almost one million inhabitants including its entire metropolitan area. It was the first city in North America with this population to build its light rail system: the Edmonton LRT. The LRT is a modern system that circulates underground in the city center in a similar way as some european systems do, such as Premetro. The Edmonton light rail (LRT) is only part of the ETS, the company that manages public transport in Edmonton, which also owns a network of metropolitan buses. LRT is one of the fastest and safest ways to travel in Edmonton. Trains run at a maximum speed of 70 km/h. Trains are electric, making them less polluting and environmental friendlier. Currently, Edmonton LRT can carry 10,560 passengers per hour per direction using 4 car trains, with a service every 5 minutes during rush hour. 95,000 passengers are traveling by day through its 15 stations. Edmonton Metro (LRT) currently comprises of one single route with 15 stations of which 6 are underground and 9 are ground level. 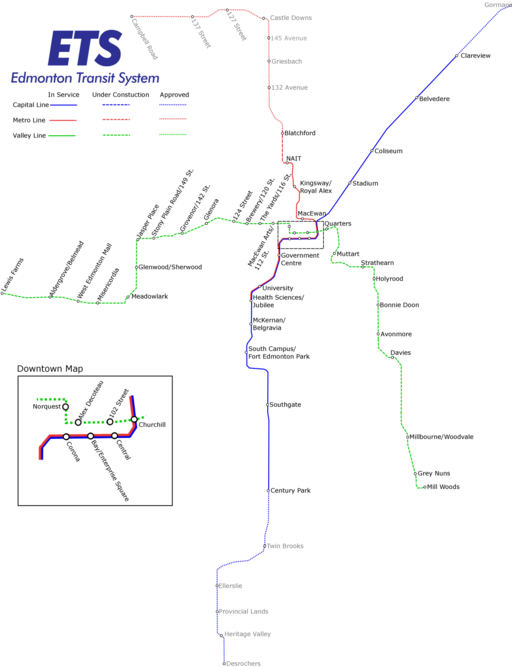 LRT serves the city from Clareview Station in the northeast to Century Park Station in the south. 7 stations are shared with the Metro Line. The maximum speed on this line is 70 km/h. It’s 21 kms long and 4.4 kilometers are underground. Stations: Clareview, Belvedere, Coliseum, Stadium, Churchill, Central, Bay / Enterprise Square, Corona, Grandin / Government Centre, University, Health Sciences / Jubilee, McKernan / Belgravia, South Campus / Fort Edmonton Park, Southgate and Century Park stations . These stations Churchill, Central, Bay / Enterprise Square, Corona, Grandin / Government Centre and University are underground. Travel time from end to end on the Central Line from Clareview to South Campus is approximately 24 minutes during rush hour. Formerly known as Route 201, now in the maps is called LRT Route. 3 stations of the Metro Line should already be open (date JUL / 2015): MacEwan, Kingsway / Royal Alex and NAIT adding 3.3 kilometers of route to LRT network. The Metro line will be 8.8 kilometers long and will have 10 stations. The maximum speed on this line will be 70kms/h as in the Central line. Edmonton Metro operates from approx. 5:00 am to 1:00 am the next day on weekdays. On Saturdays, the service begins at 5:00 am and runs until 1:30 am. Sunday service begins at 5:00 am and ends at 1:00 am. Afternoon and saturday: 10 minutes. Evenings and sundays: 15 minutes. A single ticket for adults costs $3.20 and is valid for 90-minute travel in any direction. You can also buy packs of tickets. For example, a batch of 10 tickets for adults would cost $24.00, 20 would cost $42.00. Packs of tickets can only be purchased at the online store of ETS. There are reduced rates for ages 6 to 17 and seniors over 65. A pack of 10 one-way trips to any of the above two groups would cost $21. There are also passes with which you can make unlimited travels during a specific period of time. A day pass costs $9.00 and allows unlimited travel on an adult for a whole day and it also may be accompanied by up to 4 children under 12 years. A monthly pass for adults costs $89.00. A monthly pass for high school students costs $81.00. A monthly pass for young people would cost $69.00. A monthly pass for seniors $ 14.00. An annual pass for seniors would cost $ 125.00. The same for low-income retirees is $ 54.00. Children up to 5 years, including, can travel free. You can buy tickets at vending machines on platforms and halls of any station, in addition to more than 200 sites scattered around the city. In the Edmonton LRT you dont need to validate your ticket, and there are no barriers preventing access to the trains. Random proof of payment checks are performed. The fine for traveling without a ticket is $250. There are signs in the stations indicating proof of payment areas. They are blue. As proof of payment you can show: a valid LRT or integrated service in ETS ticket. The capital line has an extension approved since 2008 that will add the following stations Gorman, Ellerslie,Provincial Lands, Heritage Valley and Desrochers to the network. It is anticipated that when this line is completed, Capital Line will have 20 stations in operation serving more than 100,000 passengers daily. Edmonton LRT expansion and development has become a priority for the municipal government, as it is predicted that the population of the city will double in the coming decades. The completion and construction of the Metro and Capital Line lines, and other routes still not approved by the government such as Valley Line, Energy line, Festival line is being encoraged. Another 12 stations will be built in the first phase of the Valley Line, which should be open by 2020. In many Edomonton LRT stations you can park for free. This service is called Park’n Ride. It is available in Clareview, Belvedere, Stadium and Century Park stations. In some stations there also are reserved parking spaces for the disabled. ¿What is Park and Ride? The option to park your private transport (car or motorcycle) in areas designated for public transport to facilitate and encourage its use so that the journey from door to door would be more direct. Ie, you want to go to work but the nearest subway station is quite far from home and there is no combination available with other public transport to arrive to your destination. The last option is to move to the metro station and there take public transportation to your destination. The possibility of easy and free parking makes a big difference and encourages the use of public transport. Edmonton LRT has enabled areas with free parking spaces. ETS is increasing the number of locations with Park and Ride. The new stations as Eaux Claires, Davies, Lewis Farms and Meadows have 200 parking spaces available to customers. There is no airport service.